In its production and all other operations, Tolliwood Oy applies principles of economic, social, and ecological sustainability. All of our raw materials originate in Finland, with most coming from certified sawmills in our local area. These sawmills all apply very strict requirements pertaining to the origin of the wood, and they do not purchase wood from any areas subject to conservation programmes. They also aim in their operations to support the versatility of forest nature, to decrease their consumption of energy, and to preserve nature in all ways possible. 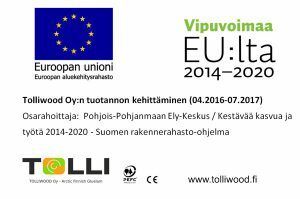 TOLLIWOOD Oy is commited to apply the PECF standard in the procurement and the handling of the timber.